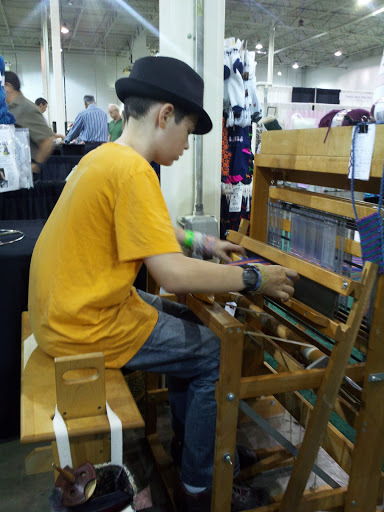 With the arrival of fall and Joram’s birthday, it is time once again for the Original Sewing & Quilt Expo. We discovered this last year, but sadly could not make it. Joram really wanted to go and I can’t remember what exactly kept us from attending. This year, our local quilt store scheduled a bus trip. Run, do not walk, and sign up! The expo center in Dulles, VA is not the most accessible location, especially with the commute traffic. I’m always a fan of riding in a comfy charter bus over driving in the insanity that is DC Traffic . My mother paid for our tickets as a birthday gift to Joram. He kept a countdown running, saved up money, and talked about the expo incessantly. It is fun to see him really excited about something he is passionate about! We packed a bag full of snacks, things to entertain us, and arose at 5:45 AM to get ready to leave. We weren’t the first to arrive at the store, but we were close. Oh, we also rented me a wheelchair for the day to help me out after my fall. I would like to say this here and now, if you are in a wheelchair for whatever reason and want to go to the Dulles Expo Center: Take a friend. The aisles were friendly enough and overall the facility was nice, but the bathrooms and food lines? Absolutely ghastly. In no way wheelchair friendly at all. Trying to get into the bathroom took so much maneuvering due to the angles and the narrow door, it almost made you wish you simply wore a Depends. That’s pretty bad. The stall was also hard to get into, and the soap completely inaccessible unless you could stand up. I could not get the wheels of the chair over the door jamb without someone pushing me. Thankfully, I don’t have a weak bladder or anything. We attended a demonstration on the stage about versatile clothing styles that I found interesting. 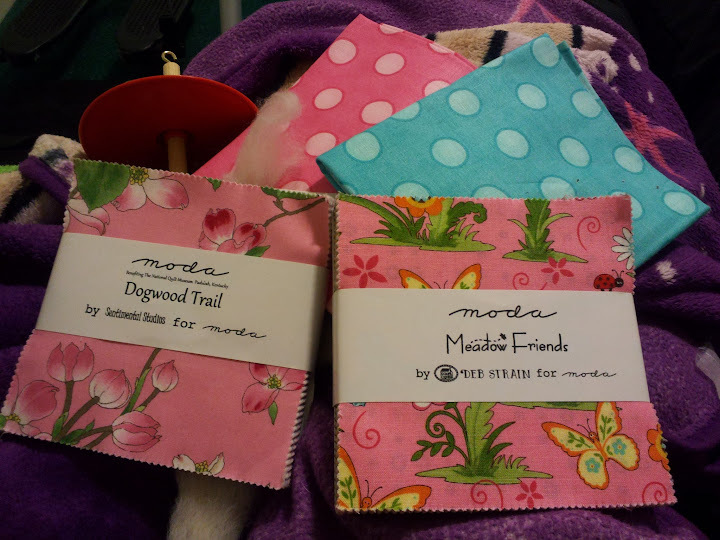 A large portion of the presentation was the heavy use of different types of interfacing. I hate interfacing with a passion, but I recognize its value. After the demonstration, I recognize that value even more. Interfacing manufacturers should pay that woman a royalty. As part of our group ticket, we received a ticket for one class. It was a hard decision, but we chose one completely based on the name. It wasn’t what we thought, but it was very informative, nonetheless. It was about modifying sweatshirts and t-shirts, a very hot thing right now. I’m excited because I bought a drop spindle. I’m sad I didn’t get more fiber to spin, but I had issues attempting to decide on fiber in the limited amount of time I was at the big yarn and fiber booth. Anyone ever spin or knit with soy fiber? That stuff was SUPER soft! Joram demonstrates how to use a drop spindle. 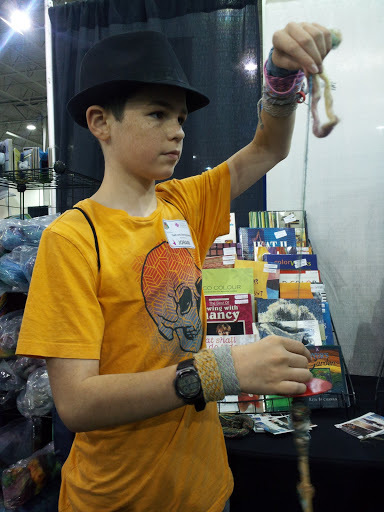 Joram, ever the master at all things of this nature, demonstrates the use of the drop spindle at The Handweavers Guild of America booth. He’s used a drop spindle before in a class at Balticon, and is quite the pro. I don’t want to admit how many years ago I used a drop spindle. We liked the spindle so much that mum and I both purchased one. She promptly handed hers over and Joram squealed. We also picked up some fiber and spun on the bus ride home. That was a lot of fun as women on the bus asked us what on earth we were doing! The drop spindle is an ancient tool that you can take with you anywhere. You can even spin while walking, an important feat to help maximize your time in eras where 24 hours simply was not enough for the daily chores. The ladies at the Handweavers Guild fell in love with Joram. 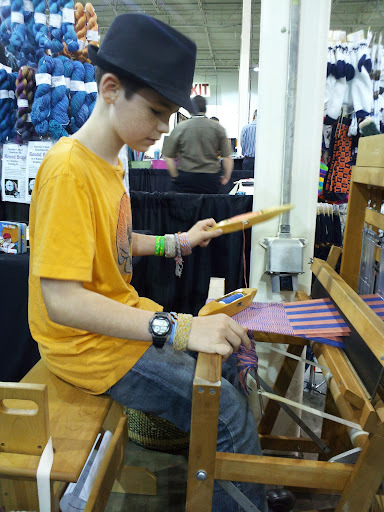 He asked about the loom set up, so they allowed him a chance to try it out. “If I’d known we’d let people try weaving, I would have loaded an easier pattern,” the lady said. She told us several times that what she had on the loom was a very difficult piece. She’s never met Joram before. Joram sat down, listened to her instructions, and began working. The loom was a nice size, but uses quite a bit of dexterity for the four pedals and two shuttles. Within minutes, he was weaving! We let him weave for a bit, long enough to completely fall in love with it. He did enough that they needed to advance the work twice. Joram makes a homemade loom! What did Joram do when he came home? 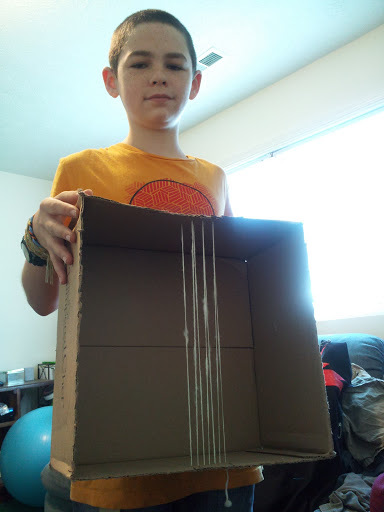 He made a loom! Who’s surprised? Not me. FYI, that’s a Pampered Chef box. I didn’t get to pick out what we ordered, either. It was HIS. And yes, that’s his yarn he spun on the bus ride. Here's my yarn, spun on the bus ride home. Check out my phat loot! Looks like I need to make a new quilt. Any ideas? Sounds like a good time! I can’t want until the babies are big enough to leave or take to events (we’re currently potty training and I HATE going anywhere because bathrooms just aren’t accessible for tiny bladders). 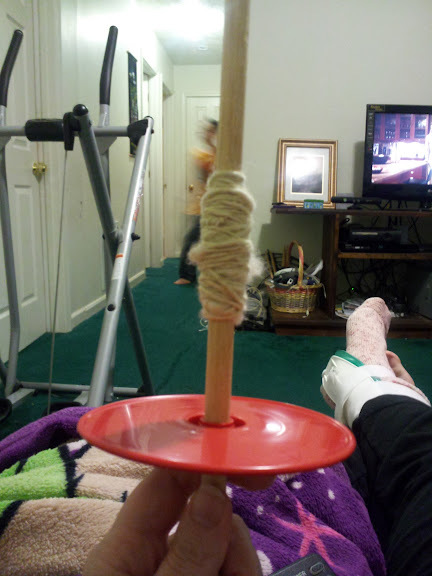 Maybe I’ll have you show me how to use the drop spindle when we visit my mom next. 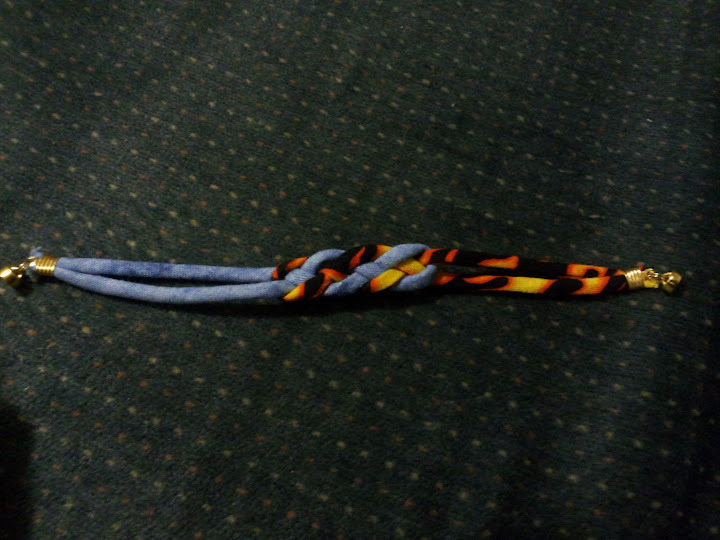 I do like to do the finger loom weaving and will make my own laces for special projects. But I need to find the website and re-print the patterns, as mine have been sucked into to vortex that occurs when moving. I’m thinking of making a Boy Scout quilt for the hubby for Christmas. I’m just sad the fabric has to be purchased from “specialty” places. Jo-ann’s carried some a few years ago. Yeah I remember the potty training nightmare. No thanks!!!!! I’ll happily show you the drop spindle. However, fiber is hard to come by in FXBG so we’d need to make sure to order it or you need to bring it. If you are really interested though, there’s a great video tutorial series on youtube. I’ll put it on your FB wall in a few. This gal shows/explains things so well.